Here we have another figure that I know almost nothing about. I've never watched Eureka Seven, but I always kind of avoided anything from it. The idea of rollerskating or surfing robots just kind of turned me off. 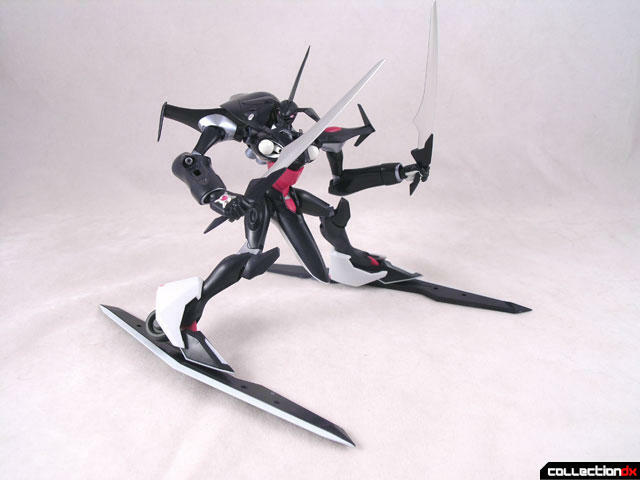 Ok, so they don't actually roller skate or surf, but the way the mecha is designed leads you to that conclusion. They all have wheels on the back of their feet, they all have what appear to be surfboards etc... I dunno. The designs never did nothing for me. Well, all except one. When the opportunity presented itself to review Nirvash Type the END, I decided to take a look. 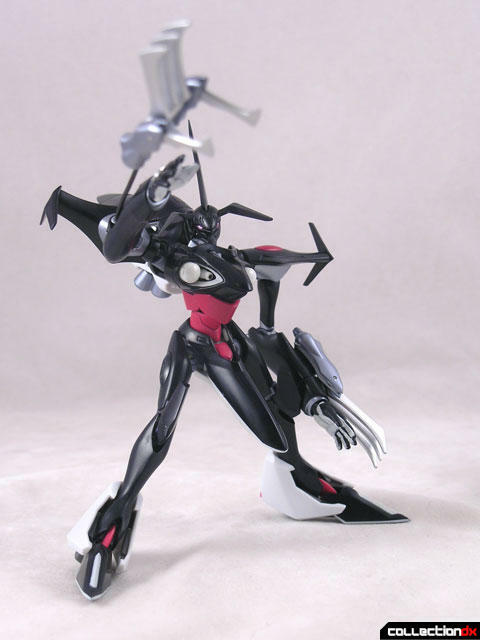 At first glance, its a dark angular mecha, with impressive armaments. According to research, Nirvash Type The END is a type of machine called an "LFO" or "Light Finding Organism". Most LFO are composite machines, featuring both organic and mechanical components. Each LFO has a pilot, and each requires something called a Compac Drive. However, there are two unique LFO that do not need these drives - Nirvash and Nirvash type the END. Reading the synopsis on Wikipedia, it reminds me a lot of Evangelion. 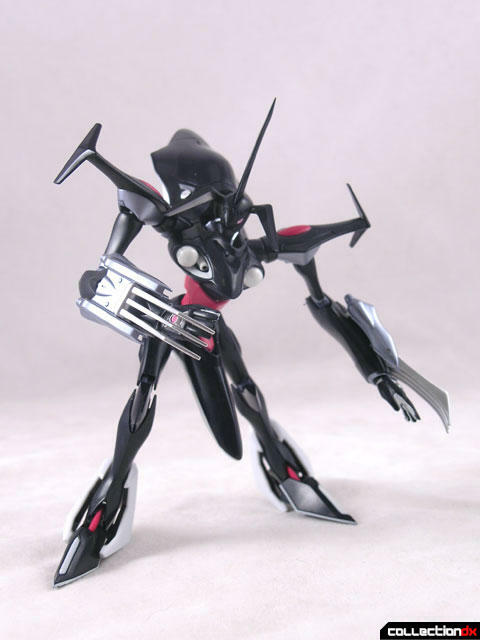 But hey, Kawamori designed the mechs, so maybe it's not half bad. 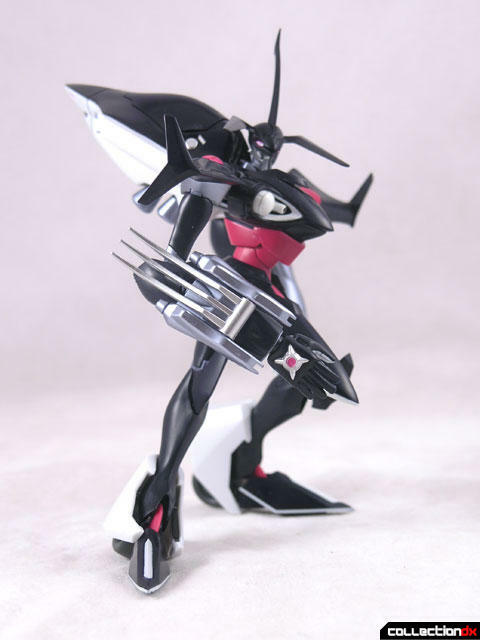 The toy itself is cool, but now that I am familiar with the design there are a few things about it that bother me. 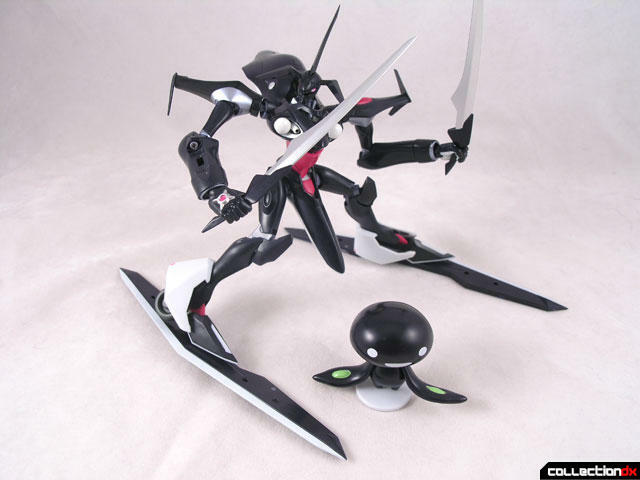 The toy is larger and bulkier than other Robot Soul figures, and accordingly has a higher price tag. The package is pretty sharp, with a green window box. 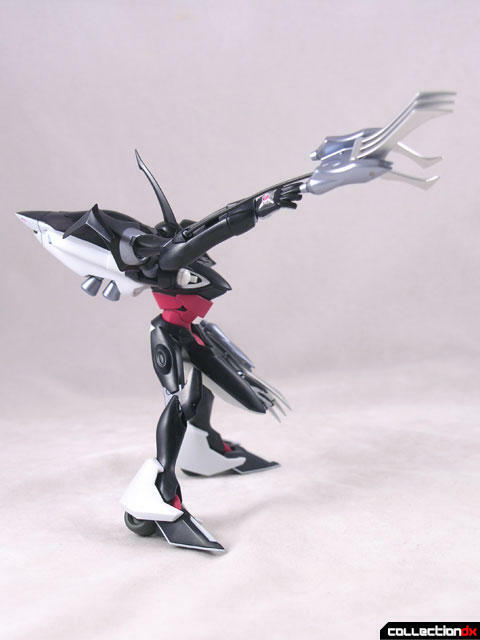 Articulation is good, but due to the way the figure is proportioned you can only pose it so many ways without it falling over. The head is sharp and glossy black, with white eyes and pink pupils. I hate to say it, but the pupils really kill it for me. I know its an oddity in the world of Eureka Seven, but the pupils just look odd. I'm sure fans of the design won't mind, but to the uninitiated, its weird. The upper body has a long protruding rear section that seems very organic in design. The upper section features an opening hatch that could be a cockpit or a weapon. The underside features two pivoting engine nozzles. On the front of the figure you have two round white areas. 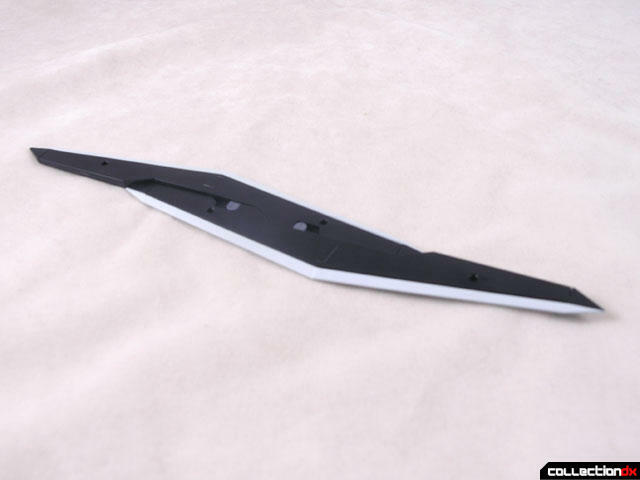 These are swappable with "open" white parts to replicate the "Vascud Crisis" weapon. Each shoulder has to support the weight of the large upper arms, and they are just not tight enough to do it. Most of the joints are reasonably tight on Nirvash the END but here they are just not strong enough. Each shoulder joint is covered on the body by a black panel which can easily fall off and get lost. I've already lost one of mine after shooting the review. There's a ball joint where the upper arm meets the shoulder section, a hinge joint at the elbow, and the hands can pop on and off a ball joint at the end of the arm. 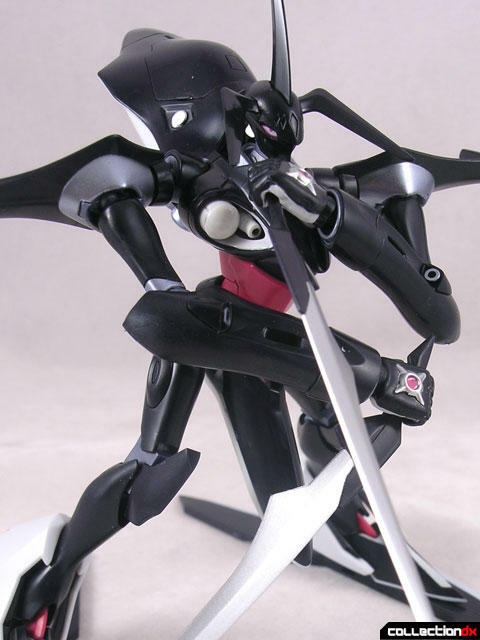 Variant hands are included that can hold two large blades. 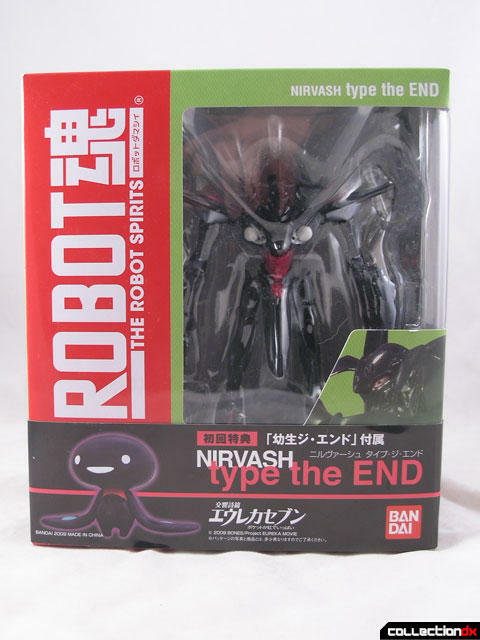 Out of the box, Nirvash type the END is packaged with large arm claws attached to each arm. The claw sections on each is moveable. Also included are to rubber coated wires that attach to the arms. 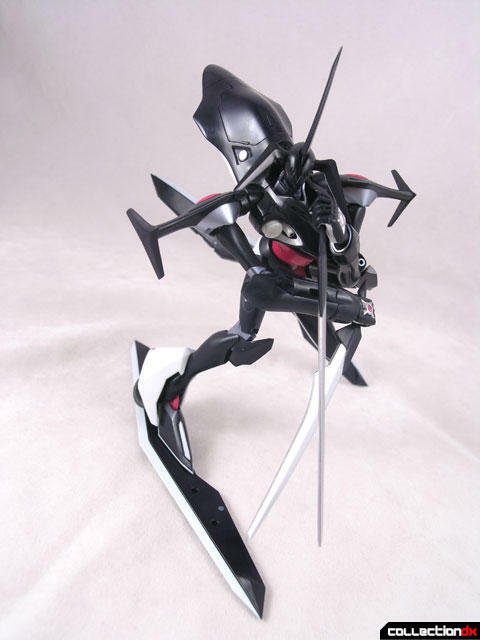 These are meant to replicate a shooting attach where Nirvash type the END can launch its claws at an opponent. The wire is stiff enough to support the weight of the claws. Moving down the figure we have another big issue with the design. And I mean it's a BIG ISSUE. To put it plainly, Nirvash type the END is hung like a bear. Whatever purpose this elongated crotch section has, I don't care. It just looks wrong. This is why we can't have anime like this in America. It could be the most interesting story in the world, and we'd still be here making jokes about robot wang. The upper legs are short and lead to dual jointed knees and then down to the feet. 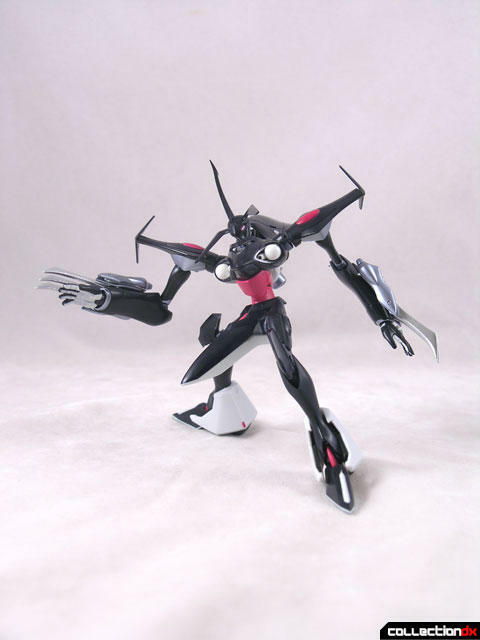 The feet have dual jointed ankles, and feature a wheel for a heel (heelies?). In another big oversight, the wheel does not turn. 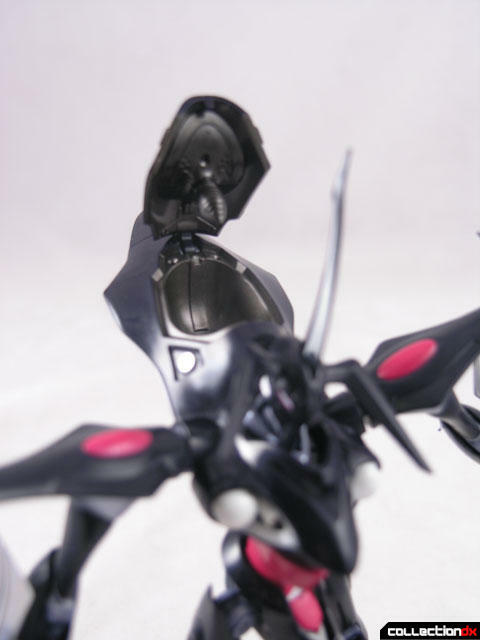 The bottom of each foot features a fold out peg that allows Nirvash type the END to attach to its Reflection Board so it can ride something called "trapar waves". 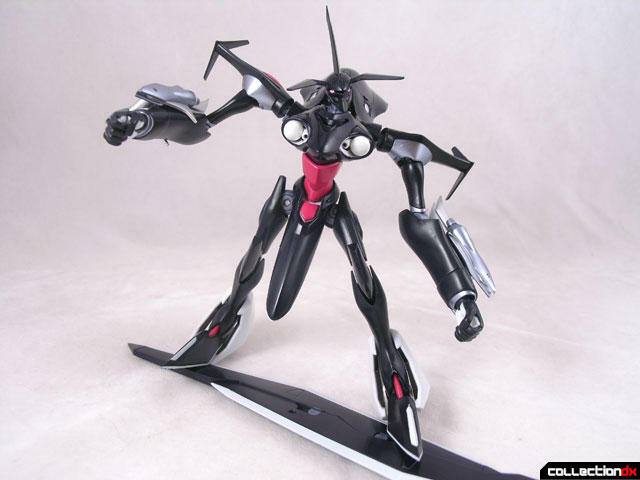 Ok, so maybe it is a surfing robot. 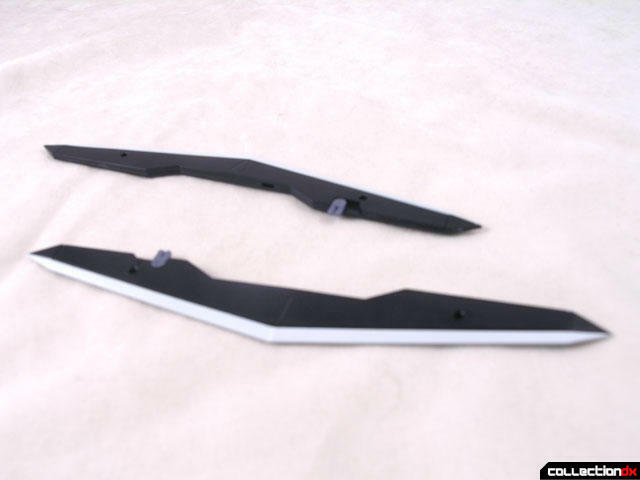 But wait, there's more, the Reflection Board can separate into separate skis for better maneuverability. 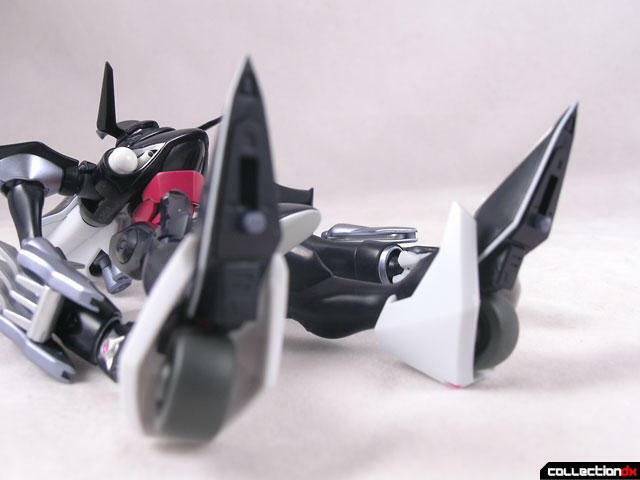 So, for all it's dark looks, Nirvash type the END is really just an extreme sports freak. 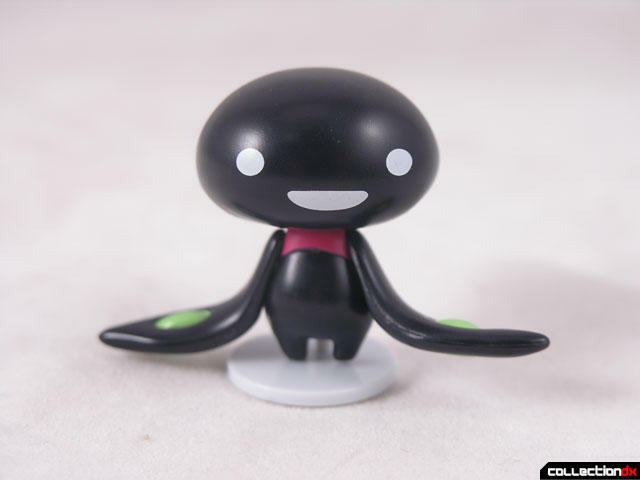 Also, the figure comes with a baby theEND figure, who knows what that is. 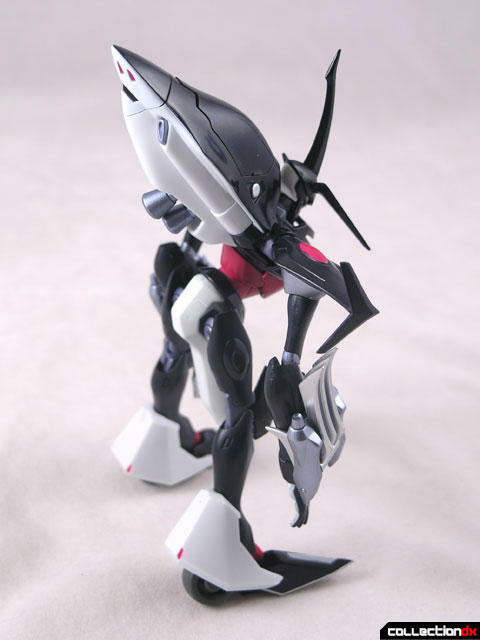 is it the infant form of this mecha? 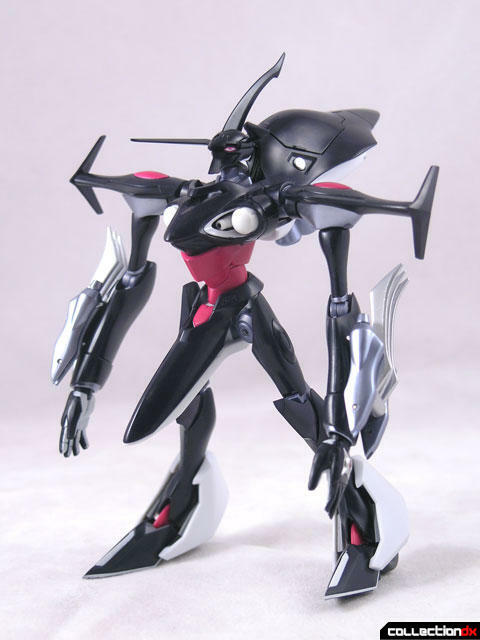 In all seriousness though, Nirvash type the END is not a bad figure, and if you are a fan of Eureka Seven, you will probably dig the design. But be aware there are a few design flaws that may hinder your enjoyment. The crotch being like that in the series. And yes this aired on US airwaves and has a dvd release. That or i never really payed much attention to it. Considering how the story is pure cracked out with good character development. Overall nice review but all the comments where kind of annoying. Just asking, but, what's the point of a review with complains of different aspects of the mech desing, not the figure itself, when from what I read you didn't even watched the show. I mean, It's a very unique desing, and you could at leasttried to find out what the little figure is. 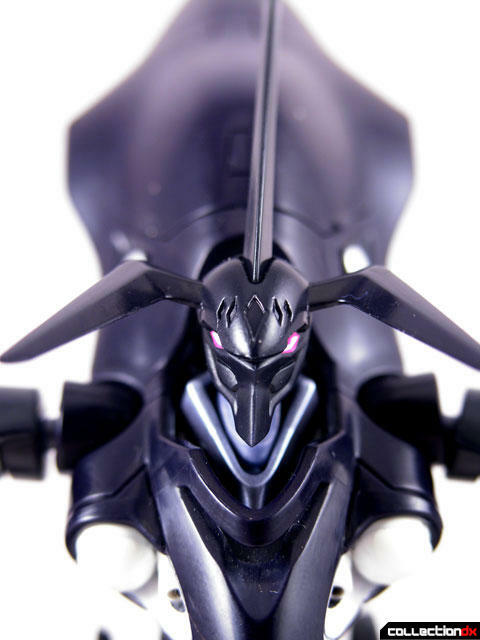 ( it's some kind of child form of the inner organism that is nirvash type the end) and the pink eyes are like that because the pilot's eyes are also pink. What's the point? Well, I'll probably sound like a traitor here as Eureka Seven is my favourite anime of all times, but it's like whining at a reviewer of a Gunpla because he he didn't watch Gundam Seed and yet dares to say he doesn't like the design... but then comes the question "are we talking about the design of the toy or the Gundam itself?". Both actually, unless you noticed it already, chara design and toy design are bound together. If you strip the toy of it's main design then all you have left is quality of materials, joint construction, box and not much more to talk about. 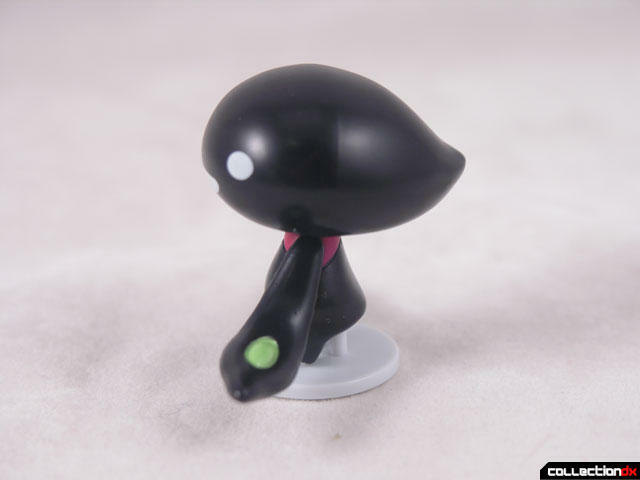 So basically you can't talk about the toy very much if you omitt the predefined design given by the anime's development team, because it makes up about 90 % of the whole toy. I find it a lot better that Josh says what he thinks, it makes his review something personal and fun to read, even if you don't always agree. Or maybe you'd prefer something like "gee, I'd really like to say what I think about the features of this mecha design, but then again, I'm risking some fanboys yelling at me and we don't want that happen, do we?" And don't give me that "watch the show! do some research! ", youe knowledge doesn't seem to be any bigger. 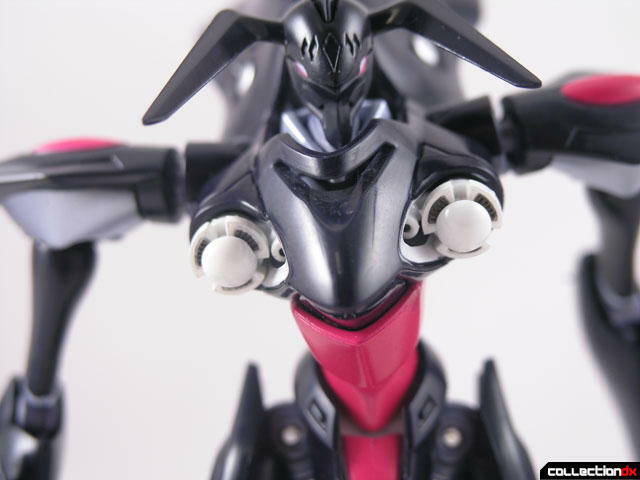 That small toy is an SD version of type theEND and it was Bandai's very idea to make the toy more attractive. No such thing ever appeared in the show. 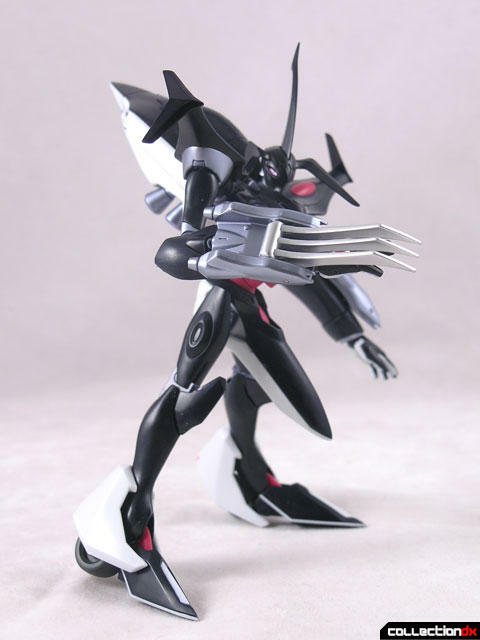 Should that be the Nirvash in pre-robot form, you'd see something completely different. 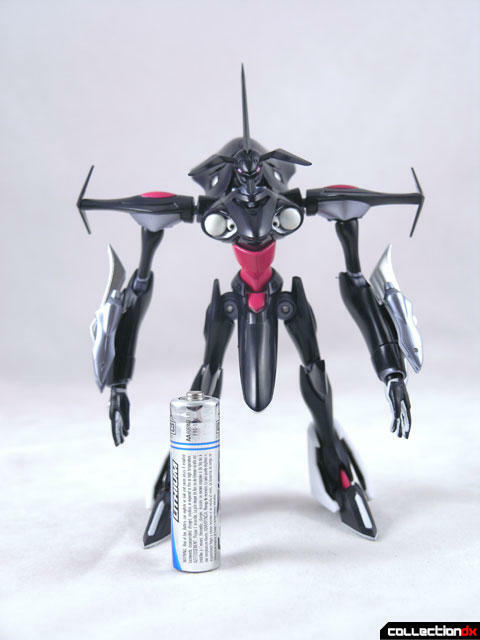 Argument that Nirvash's eye color reflects the eyes of the pilot is also only half right, because that would mean that Nirvash typeZERO eyes should match first Eureka and then Renton. Gosh, what will happen to his eyes when they pilot him both at the same time? Nothing, it still has green eyes behind green windows. 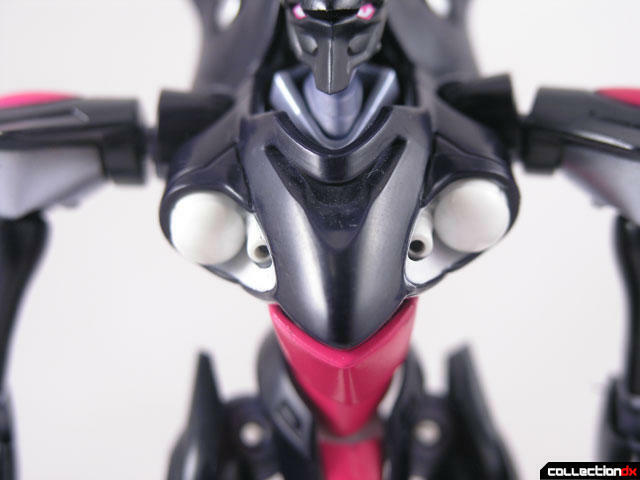 I'd rather say that theEND's eyes are a result of the material used to build it rather than it's pilot pupil color. 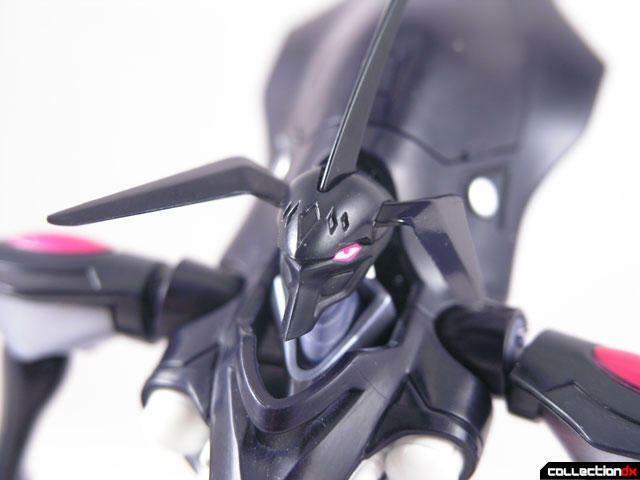 Especially that in the manga its piloted by several people and no change in its eyes occurs. Sorry for that monologue Josh ^^ And jus to help, that big bulb with the hatch on the robot's back is its cockpit, that bee-nest-like thing is where the pilot plugs himself in to control the robot. That said, while I could've done without all the negative comments about the mecha's appearance, the ups and downs of this particular toy WERE covered, and that's really all I ask for in a review. Mine tends to come apart at the waist, do you have any problems with it? The one thing I can think if is that, design wise, the enlarger crotch-piece probably helps counter-balance the huge back cockpit bit. 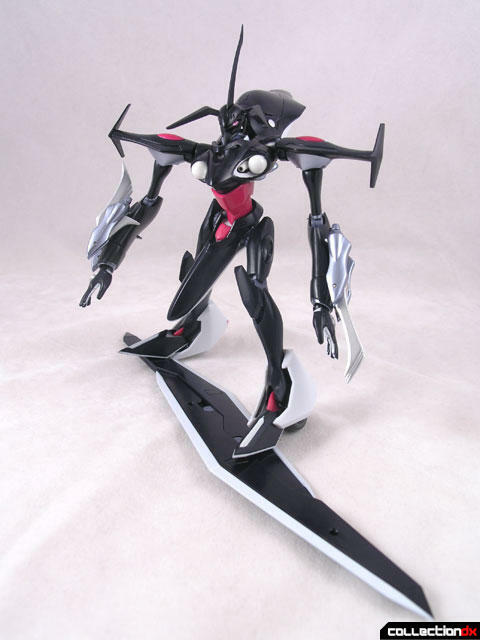 Interesting figure, and I think I'm going to have to check out some members of the Robot Soul line. Hey, Votoms made rollerskating robots cool! 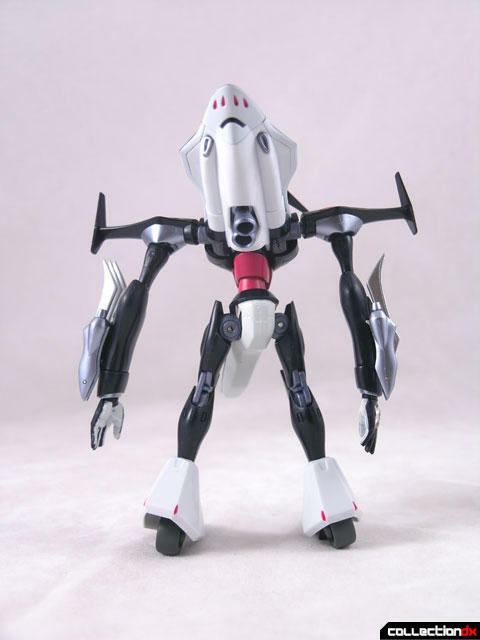 This guy reminds me of the Patlabor Griffon.